MediaCrooks: Can't Buy A Channel? Buy A Few Journalists..
Can't Buy A Channel? Buy A Few Journalists.. Sometime back I wrote: “Does Reliance really expect to earn money from an investment in TV-18 group? Does it expect to earn money from any media group? With investments like 1500 or 2000 crores, which is peanuts for Reliance, what do they really aim to earn? Your guess is as good as mine”. The answer seems pretty obvious. And the answer comes from a media celeb himself. Yes, none other than Shekhar Gupta of Indian Express. “The fixer-businessman's new badge of honour— and disgrace… Besides political connections, there is one equally significant common thread linking the owners of chit fund companies currently under the scanner in the east. They are all media owners as well… but an investment that was monetised in other ways. It secured you political patronage, protected you from the police and regulators, helped you fix your rivals and, as in the case of the head of the media ventures owned by the Saradha group, got you a seat in Rajya Sabha. One thing it rarely made you was old-fashioned profits”. Does that explain the Reliance investment in TV18? And, of course, the Saradha guys aren’t the first ones to get a Rajya Sabha seat. There’s Shobhana Bhartya of HT, but for her the media is not a hobby; it’s a full time business. SG quite sensibly avoids the issue of media celebs also getting Padma awards. That would be quite damaging to his own cause. Wouldn’t it? “Matang Singh, who appeared from nowhere to become a minister in Narasimha Rao's cabinet in Chandraswami's heyday and disappeared equally mysteriously. If he and his wife Manoranjana Singh made any money running the media business, we do not know, but it seems unlikely. Rose Valley, Tower Group, Shine Group, Rahul Group, Chakra Group and G Group, all under the scanner now in Bengal, have the same basket of interests: chit funds, real estate and media”. A man from “nowhere” as SG describes Matang Singh is now a tycoon and his wife, Manoranjana, was the one who defended Nalini Chidambaram as being “innocent” in the Saradha Chit Fund scam. Everybody is innocent in politics and media. “And sure enough, the biggest business houses in India have tried their hand with the media and retreated with burnt fingers and singed balance sheets. The Ambanis (Observer Group), Vijaypat Singhania (Indian Post), L.M. Thapar (The Pioneer), Sanjay Dalmia (Sunday Mail), Lalit Suri (Delhi Midday), are like a rollcall of the captains of Indian industry who failed in the media business… But there is a difference between then and now, and between them and the state-level businessmen investing in the media now. They failed because they did not respect journalism. The current lot are setting up or buying up media mainly because they do not respect journalism, because they think all journalists are available, if not for sale then for hire, as lawfully paid employees. If you have a couple of news channels and newspapers, a few well known (and well connected) journalists as your employees, give them a fat pay cheque, a Merc, and they solve your problem of access and power. They also get you respect, as you get to speak to, and rub shoulders with top politicians, even intellectuals, at awards and events organised by your media group”. In short, what SG is making a confession that “paid media” as it has come to be known is an epidemic. That almost all big business houses buy journalists just like they buy their fancy cars. And some of these journalists are on your screen 24X7 or somewhere in the print media. I am not aware SG has a presence in the social media in terms of a Facebook or Twitter account. If he were, he might get to hear some very unpleasant things about his profession and perhaps about himself. Those who scream loudest about integrity and credibility are possibly the ones who have been bought long time ago and have gone through some sort of reform in the last few months. You might have heard of those too. SG is wrong in assuming business houses do not respect journalism. It’s the professional journalists who brought the disrepute upon themselves. Seriously, you can’t be soliciting on GB Road in Delhi and then lament being called a prostitute. Can you? “Most of us, particularly senior citizens in the profession, have stories of cash-rich businessmen promising "blank cheques" to set up new media companies. My favourite is of a well known and, frankly, well respected and clean real-estate baron coming in to see me once, in evident distress, and asking if I would set up a TV channel for him, whatever the cost, Rs 300, 400 crore. I asked him why. Almost every news TV channel in India was losing money. He said he had spent all of the previous day waiting for his turn at a land allotment meeting in Noida. Nobody asked him even for a glass of water, while all those who owned some media were ushered in with respect as soon as they arrived. And of course, the deal would have cost them much less. He had walked out with the resolve to set up his own media. I did explain to him that, in that case, he had come to the wrong people, but he isn't the only one of his kind you would come across lately”. If one were to make an educated guess it’s not too hard to shortlist a few real estate barons from whom one met SG with the proposal. I remember a real estate guy telling SG that bribery for him meant payment for “speedy disposal” of files. SG didn’t bat an eyelid then. I would consider that real estate baron who met SG somewhat of a bimbo. Why would a guy approach the editor of a failing newspaper to set up a TV channel for him when he could very well buy a huge stake in a loss making TV channel with something like 300-400 crores? That’s not too hard to do and it saves the additional expense and energy of promoting a brand new channel. The other confirmation that SG provides is that most TV channels are loss-making businesses. Question is, how do they survive then? As with many other businesses news channels too are likely to have a heavy dose of black money flowing through their veins. The Zee News extortion case is still on. A rival channel, NDTV, has investments from the Jindal group. CNN-IBN group has investments from Reliance. It is unlikely any channel or any major newspaper survives without politically supported funding. The investor maybe a corporate body but the investment could happen if a political big shot were to make a phone call and put in a kind word. That’s what fixers do. They make both “ends” meet. Nothing in the media is going to change unless the editors’ union get together and pass strong rules and guidelines themselves. They are feeling the heat from the social media. And here’s trouble. So far those who couldn’t buy whole channels were buying individuals or groups of journalists. Even that glamour may pass and if they don’t change, such purchases may shift to social media. The influence SM will exert is likely to grow by leaps and bounds. The investments will flow there if the editors don’t get their act together. Very powerful article. I believe whether on buys individuals or channels will not help much, in case of political parties. Because, SM activists have become very much discerning vastly different from earlier news readers/followers. The fact that SG has started lamenting is probably because he has outlived his utility. If your razor has 5 blades would you still need to look for a "bright spot in a man's morning"? Great article Ravi. Was expecting this after reading SG's piece yesterday. I don't think anyone is turning new leaf. They know their core constituency is the educated middle class who read them because they think they are honest and credible. That's what gives them TRPs and the resultant power with corporates. If people find out they are dishonest, they will stop reading, watching them and the power will disappear. So it is an effort to retain their core constituency, the educated middle class, by pretending to introspect, not really introspecting. The educated middle-class do not read them because they seem to be honest & credible. I seriously tend to think that people buy newspapers because the papers offer them something interesting to chew upon(although its propoganda)at a very low cost. So its a win win situation for both Media & common readers. We do know that the MSM is servantile to the dynasty but the common man is not bothered by that if he gets some cheap entertainment while drinking tea of coffee. "Seriously, you can’t be soliciting on GB Road in Delhi and then lament being called a prostitute. Can you?" No one can put the predicament of MSM more succinctly. Shekhar gupta's company got a lot of contracts in Common Wealth games.Who's gonna probe that? Ravinar .....this one is really a sharp one....my thousands bows. I do not think they will change so easily. There are lot of stakes involved. They are just making noises to gain lost credibility. To me journalism is nothing but brain prostitution. Is it that honesty is such a bad world in journalism? Have some people made some money here and there? Perhaps. But again as Sekhar Gupta said in IE, “bade bade games main aise chote chote baatein hote hi rahete hai Senorita” and so there is no need for this Munni badnaam hui insanity that has gripped the nation.-----Quote from Shekhar gupta...Indian Express. Ravinar's appeal to a section of the educated class is based on integrity, logic and facts - something that should appeal to a majority of the educated class save those who have sold their conscience. But it appears that quite a few of them are so drugged by MSM propaganda over decades (most of us were fans of Prannoy or Barkha at some point in time) that it takes quite an effort to shake them off their stupor. The only hope is that readers of MC and other blogs that seek to unmask MSM initiate as many as they can to the deceit, venality and perniciousness of MSM who I believe are in a last-ditch and highly coordinated / orchestrated / funded effort to perpetuate their stranglehold and that of their masters over the Indian citizenry. It is indeed a 'dharamyuddh' in which all of us have to participate. Well Well Well, there are many who would still believe BD like an innocent child and there are people who wont even give a damn. Many of my colleagues do not even know about Sharada CF scam yet and they are well educated and have 24x7 access to internet. Neither they want to wake up or get involved in anything. However, worst above all are the people who even after knowing truth or understanding what's right or wrong praise people like BD or RS. So, waking up people is a big task here. I agree with @Verma. In spite of all the right minded people out here, we do have to realize that we are a minuscule minority. Most people that I know; highly educated, very articulate simply do not understand all this subtle MSM propaganda. No one cares what the hidden agenda of BD or RS is. They simply cannot fathom the obvious correlation many times. This could be due to several reasons: lack of interest, apathy to political news in general, or lack of adequate information (the light we are trying to show). Indeed, a big task to wake up! Manoranjana..Who is she is? Though SG has a lot more on her but revealed only a small bit. She was Manoranjana Gupta...a very ambitious journalist who worked in FE! A journalist who was feared by most Ministers in PVNR Govt. She handled power sector beat in 1992-93. A couple of years later, seeing her huge influence over the Cong regime, she was offered a plum post in Observer. Senior journalist of that time say that there was a strong rumor back then that she was about to marry Kalpnath...! But 'Raja' Matang Singh surprised many by marrying her. Raja Matang befriended Hiteshwar Saikia's son and the duo started many ventures...! Jaggi from FirstPost shares something on similar lines..!!!!! "Nothing in the media is going to change unless the editors’ union get together and pass strong rules and guidelines themselves", you can't be serious, or can you ?? The scene is really bad, its Paid news everywhere. You take anything from Political News to Film Journalism everything is sort of Paid news. Its very difficult to get a true or unbiased news from today's newspapers, news channel. I have a question: From where to get true or unbiased news. I dont want views, I want news. Where can we get it? Nothing in the media is going to change unless the editors’ union get together and pass strong rules and guidelines themselves. They are feeling the heat from the social media. You mention this in you last para. They will REGULARIZE the social media is some time surely, so noe talks about them. received and completed reading - social media as watchdog - excellent reading.thanks.when is the next - india's worst journalists - being posted ? I do not want to rub-in. But please recollect your belief in Arnab's integrity. 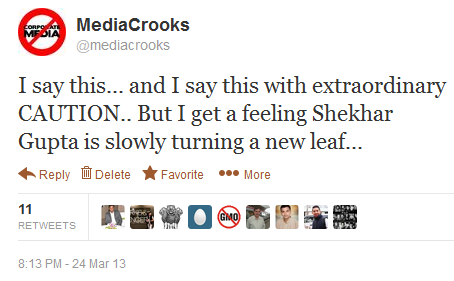 Here is the example of how much these media crooks have fallen. Today April 30th various reporters are talking to Skihs gathered outside Karkardruma court. At around 3:05PM TIMES NOW journalist gave mike to one Sikh. That man started saying "... sonia jiske husband Rajeev....". Even before the word Rajiv was completed the audio was lost and camera shifted to another view. In less than 30 seconds it is back on same location talking to some other person. Its wrong to put all the blame on these anchors/editors.Real culprits are shady corporates, politicians and even builders, who are owners.Can any of the employee of outlook magazine owned by Raheja builders in Mumbai dare to pick a fight with the government and retain his job. My own view is most of these anchors are forced to take a particular line.Sadly, politicians of various parties seem to be okay with the state of media in India, in the same way they are okay with the state of police, judiciary etc.etc.. I think the spineless Hindus(including me) deserve this. Entire blame should be on the people of India who are most corrupt!!! You get the govt. You DESERVE!!!!!? Only a bloody revolution will find anew way!!!! has any one found a cure for cancer? When that happens CONGRESS will be destroyed completely. Good you applied caution. Social media has made Media's reports are not to be treated as Gospel Truth and hence we are observing a shift in pattern. Any day nobody can be defended continuously. Gadkari is a proven example.